Spike is a 20 Amp, H-Bridge Relay Module that is small enough to be remotely mounted almost anywhere on your robot. Spike is designed for driving small motors in forward, reverse, or stop (brake). Spike is opto-isolated at the signal input to protect the Robot Controller against motor noise and return currents. Requires a 3-wire cable for connection to the Robot Controller. Ideal for 2 independent solenoids, light, pumps. Design will accept auto-resetting circuit breaker. The Ball Shifter is the ultimate solution for a two-speed transmission in a competition robot, enabling seamless "on-the-fly" shifting in a compact, light, and easy to maintain package. Three carefully selected ratio options allow for maximum versatility. Every aspect of this transmission was designed with size in mind. The Ball Shifter puts a 2-speed transmission into a tiny, lightweight form factor. The ball lock shifting method reduces the gap between the two gear reductions and allows for an extremely narrow assembly. The gear reductions were specifically chosen to reduce the overall transmission size and complexity. Highly efficient due to the AGMA 11 quality gears with teflon infused ceramic coating. The same old two stage gearboxes teams have come to know and love. This is the latest and greatest update to the basic layout John V-Neun & Paul Copioli created for the original "Kit Transmission" included in the FRC kit of parts in 2005. After years of iteration, this gearbox has several subtle features which add to its superior performance. Plastic Housings, Aluminum Shafts and Aluminum Gears provide for a light weight package. The specific transmission layout and ratio selections allow for an extremely small form factor, without a lot of complexity! Omni-Directional wheels roll forward like normal wheels, but slide sideways with almost no friction (no skidding during turns). Use these wheels to make your robot turn smoothly or build a holonomic drivetrain. VEXpro Omni Wheels are manufactured from Glass-filled Nylon with high-traction rubber rollers. Compatible with VEXpro VersaHubs for driving with a sprocket or can be used with bearings for use on an axle. These omni-wheels were designed from the ground up to give the smoothest ride possible. Our construction method, using a dual roller design, allows for a constant contact patch with a narrow profile. Each roller is tailored for the individual wheel diameter, and provides the correct, constant radius. We don't share rollers between wheel types -- these wheels aren't "almost round" they're actually round. This smooth-ride provides higher efficiency and reduces wasted power! Omni wheel assembly hardware is separate from sprocket mounting hardware. Sprockets are screwed into captive 8-32 standoffs. This allows for easy removal and replacement of sprockets without disassembling the entire wheel. No more worrying about your whole wheel falling apart just because you wanted to remove the sprocket. Mecanum wheels allow savvy robot designers to create drivetrains capable of moving in any direction using a standard chassis shape. Simply power each wheel with a different motor and change the directions the wheels spin to get your robot to move in different directions! 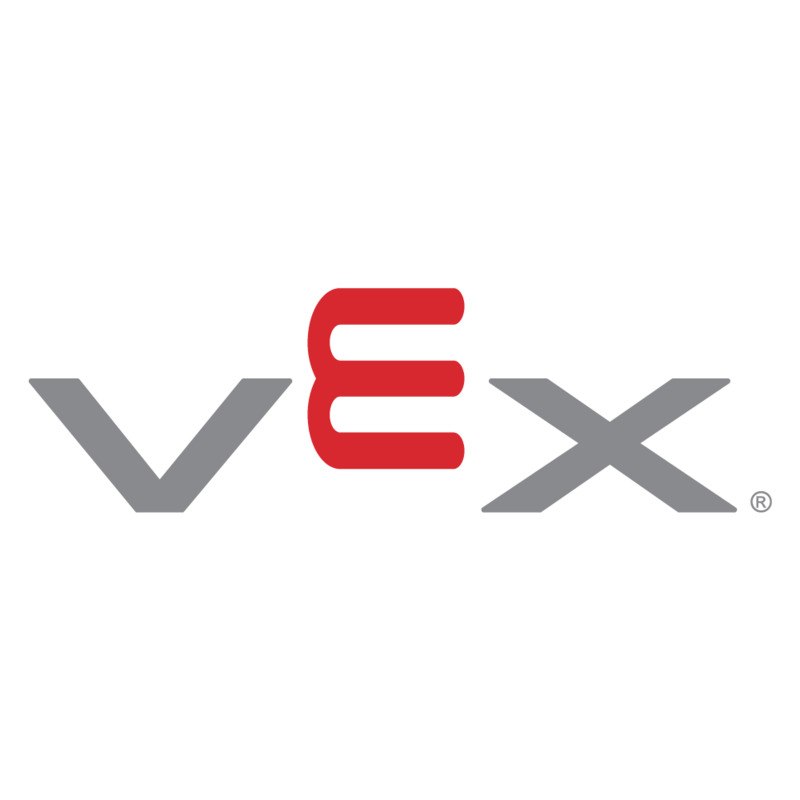 On Sunday, January 6, the VEXpro team designed, prototyped and built a robot chassis and drivetrain intended for use by FRC teams in the 2013 game, Ultimate Ascent. Chassis Kit Dimensions: 23.5" x 31.5"
Does NOT include Pneumatic Cylinder.